One day, the moon suddenly explodes. The cause? A sentient yellow octopus-like creature who promises to do the same to the Earth in a year unless he is killed! However, he requests that he is given permission to teach a class of students for an unknown reason, and the Japanese government realizes it has the opportunity to train the students to kill their teacher. Thus, the assassination classroom is created. Although Class E has been able to stand on their own against the school baseball club thanks to Koro-sensei’s training, the game is hardly over yet, and the principal still has an ace up his sleeve! Later, the students have fun with body painting and are introduced to their new teacher, the seemingly friendly Akira Takaoka. Assassination Classroom is a good series for anyone looking for a mostly lighthearted comedy with a few feel-good life lessons dropped in as well. Assassination Classroom’s fifth volume has two primary story arcs with one short comedic chapter slipped into the middle. The two larger arcs are the baseball game (which volume 4 left off with) and the arrival of a new teacher, and both arcs are written interestingly enough to be engaging despite having less of a focus on comedy than the series has had in the past. This is primarily due to the way the two antagonists of the arcs (the principal and new teacher, respectively) both present new challenges and offer great opportunities to highlight different aspects of the series. In the first portion, we get to see the continued struggle of Class E against a school system that has it out for them, while the second half explores the previously enigmatic Karasuma-sensei. I felt like this diversity was a benefit to the volume as a whole because it made the under-200-page volume feel more dense. The other area that I felt like the fifth volume excelled at was one that has been shared with previous volumes in the series, the exploration of individual students and the development as a class. Honestly, I still have a hard time differentiating between some of the more minor students in the class, but it helps that every once and a while a chapter rolls around that focuses heavily on one student, such as the midway comedy chapter this volume that focused on the artsy Sugaya. The story really succeeds when it treats the students as a class and the focus is on their development as a group, because with the limited amount of time the story has had, it is difficult to dedicate significant page space to each character. The knowledge the class has gained in their time as Class E has made them work better both individually and as a team, and the conflicts really highlight this well. One thing I noticed that Assassination Classroom as a series likes to do is consistently end on partial cliffhangers. This is annoying for a couple of reasons. First off, it means that not only will the volume end on a cliffhanger, but the beginning of each volume has to pick up in the middle of a story arc from the previous volume, something problematic unless readers are reading the volumes in quick succession. The other issue is that the cliffhangers themselves really aren’t all that fantastic. They not only fail to provide a whole lot of tension to build anticipation for the future releases, but also feel arbitrary as the narrative has zero benefit from the points that the cliffhangers are placed. To help illustrate the point, I feel like all of the volumes would flow better if they were pushed back a chapter, so that the first chapter of the first arc would be included and the first chapter of the unfinished arc would just go in the next volume. The facets of this problem combine to just make the whole thing an annoyance for both myself and others who just want a complete story stored in one volume. The other thing that is worth mentioning is that the fifth volume of Assassination Classroom really doesn’t have the same level of comedy as previous volumes due to the relative seriousness of both of its main plot arcs. I think that it is nice to have a certain amount of seriousness and that the break in comedy is both incomplete (there are still plenty of jokes) and a not-unwelcome temporary shift. However, if the primary reason you read the series is for the comedy, this volume will be a bit less interesting for you than previous ones. Assassination Classroom continues to be a pretty solid purchase in its fifth volume, which features new and interesting scenarios for the students of Class E. Through these conflicts, I felt like the progress of Class E as a whole is highlighted effectively and interestingly. 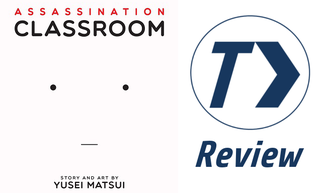 Although there is less comedy this time around and the repeated cliffhangers are slightly grating, the series is a fairly easy one to recommend to manga fans, and if you have been enjoying Assassination Classroom already, then be sure to pick this one up. Assassination Classroom Vol. 5 was published by Viz Media on August 4th, 2015. The series began being published by Shueisha in their Weekly Shounen Jump imprint in 2011 and is written and illustrated by Yusei Matsui. An anime adaptation by Lerche aired from January to June of 2015, with a second season already in the works. Volume 6 will release in English on October 6th. For more reviews, keep an eye on AniTAY as well as Taykobon, your home for reviews of manga and light novels. You can also follow us on twitter @taykobon for more updates! If you’ve read this work or have any questions or comments, we would love to hear from you in the comments below!